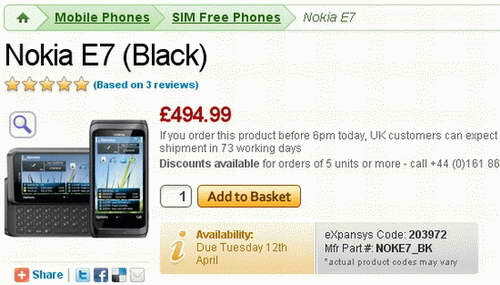 UK online retailer, Expansys recently announced that the new Nokia E7 smartphone will be available at their store by April 12, 2011.The new Nokia E7 Smartphone will be available for a price tag of £494.99 (about €576 or $785). 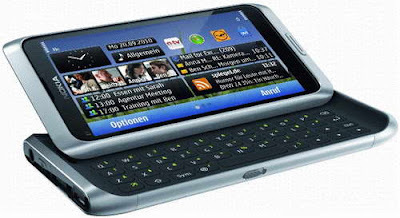 The sliding QWERTY Nokia E7 handset equips a 4-inch AMOLED touchscreen display with 640 x 360 pixel resolution and is powered with a 680 MHz ARM 11 CPU with OpenGL-ES 2.0 3D acceleration. The new Nokia E7 Smartphone runs on symbian^3 OS and Features 8 Megapixel auto-focus camera with Dual LED Flash and geotagging, 256MB RAM and a 16GB internal memory.The smartphone weighs 176g and its dimensions are 123.7 x 62.4 x 13.6 mm. Tags:-Nokia E7 Smartphone price, Nokia E7 Smartphone UK launch, Nokia E7 Smartphone UK price, Nokia E7 Smartphone Price in UK, Nokia E7 Smartphone rlease in UK, Nokia E7 Smartphone UK availability, Nokia E7 Smartphone UK details.